I can’t believe it’s already been 4 years since I first visited Greece. This time I was there for almost a week – Saturday night to Thursday night – and it was mainly for work. And this time, the quality of the food we had everywhere really made a big impact on me; I came back to London thoroughly missing the food and the weather. I arrived at my hotel at about 9pm on the Saturday night and after dropping everything off in my room, headed straight out again for nourishment. Nearby to my hotel is Ravaisi, a souvlaki place with outdoor seating (packed) and a long queue for takeaway – promising signs indeed! At €2 for each sandwich, I thought things would be petite and hence ordered one pork gyros sandwich and one of chicken too. They were huge – each the size of London burritos – and, of course, I couldn’t finish them. They were excellent though! 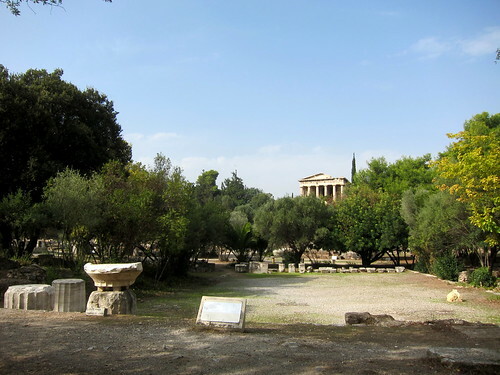 … and then the Roman Agora. 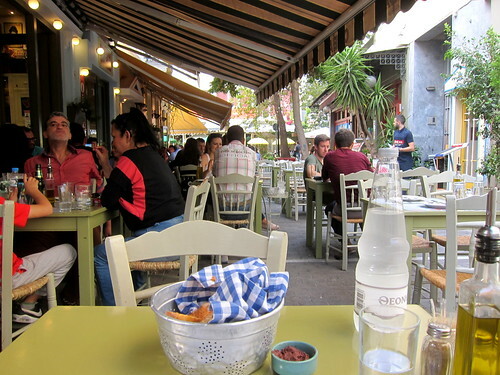 Lunch was at a suitably Greek time of 3pm and I headed over to Oineas, which seemed to have good reviews on Google. I wasn’t disappointed. 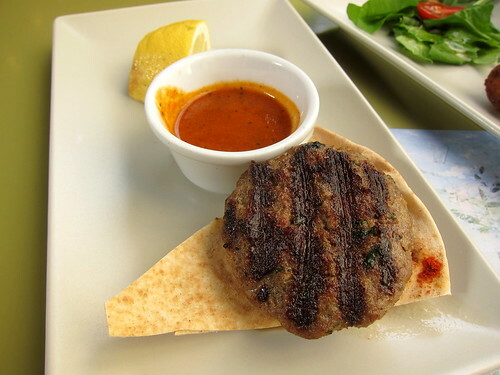 … and this homemade little burger patty with a delicious spicy sauce. 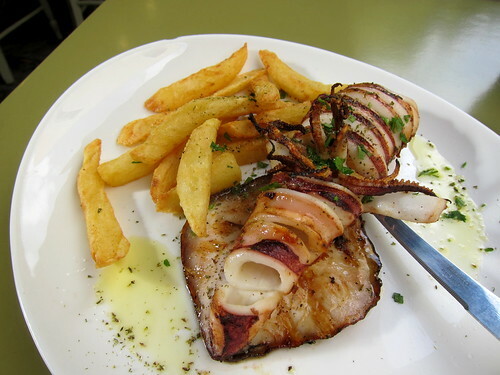 My main course was a tender grilled calamari and homemade fries and its size did defeat me after all that initial cheese and meat. 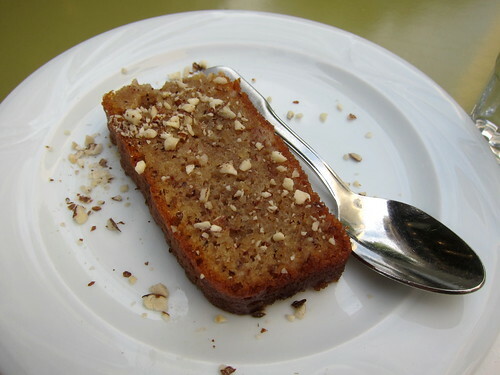 I thought I couldn’t fit in another bite but when a little slice of syrup soaked walnut cake was deposited on my table along with the bill, I tucked into that too! 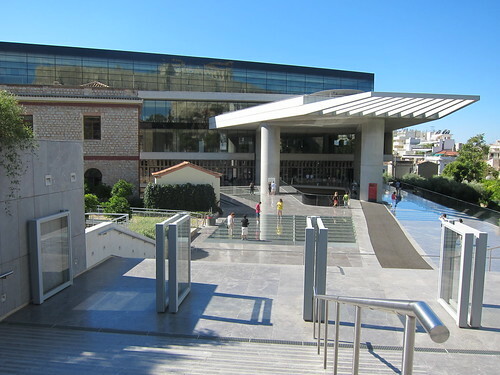 That afternoon was spent at the National Archaelogical Museum, which is truly worth a visit if you have the time. The treasures within are indeed jaw-dropping. 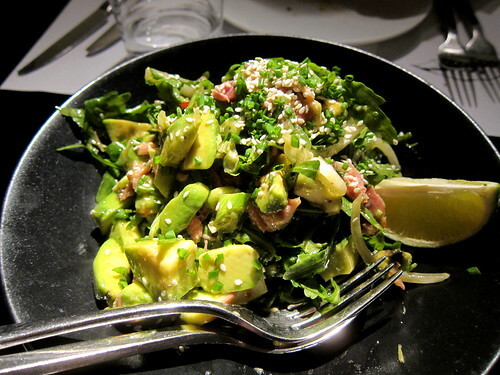 … and a refreshing salmon and avocado salad. 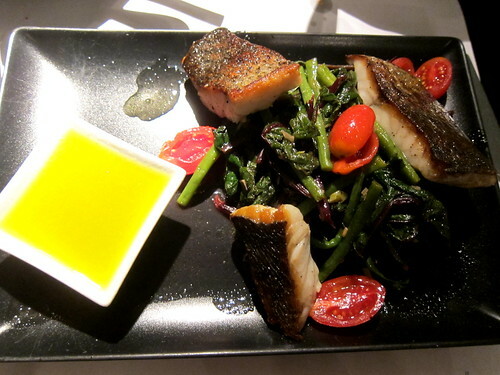 My main course was a grilled croaker served with a little mound of Swiss chard and tomatoes and an excellent lemon sauce. We couldn’t fit any more after this, which was a shame as the food really was very good. I loved seeing another side of Athens. 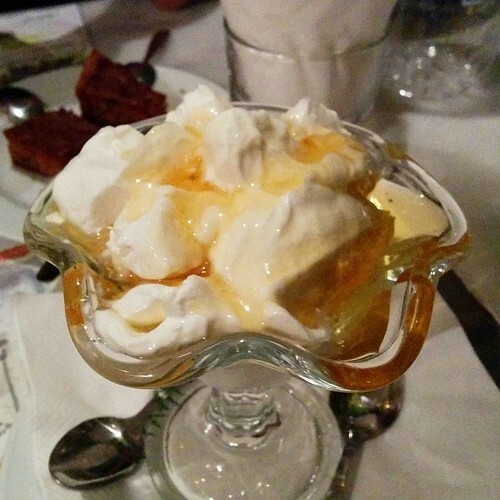 … a Greek salad (not pictured), and finally a couple mountains of Greek yogurt with honey. Prices were extremely reasonable and I’d definitely recommend it if you’re looking for a place in the heart of the city. 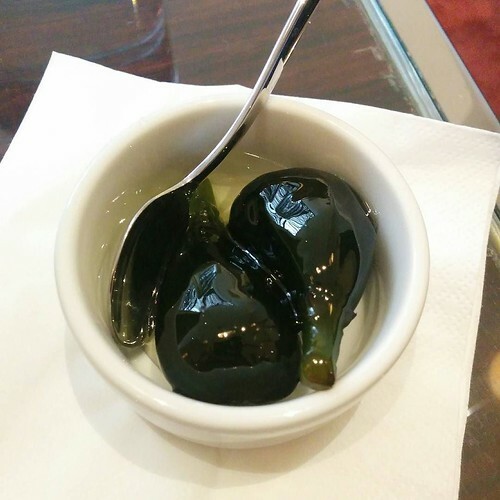 Sometime the next day, I discovered Greek spoon sweets, the jammy candied fruits traditionally served with a spoon to guests as a sweet welcome. These little figs were insanely delicious and I after this introduction, I bought a couple of jars of spoon sweets to take home and we’re enjoying them with Greek yoghurt at home. 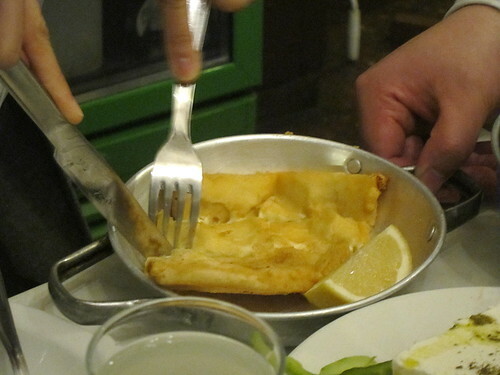 … and also recites what can be ordered freshly made from the kitchen. You make your selection, start with what’s already ready to go, and wait for the rest of the dishes to be prepared. 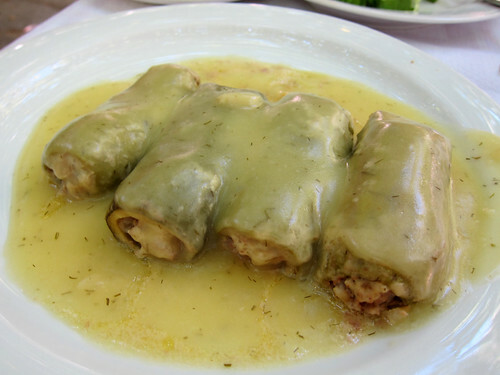 Let’s see, clockwise from the right in the photo below, we have giant beans, stewed pork in wine, dolmades in lemon sauce, and tyrokauteri (a fantastic spicy cheese). 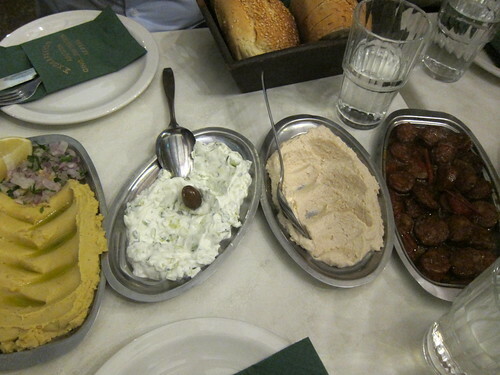 Let’s see, left to right below, we have fava (one of my favourite dips, Greek yellow split pea puree), tzatziki, taramasalata, and spicy pork sausages. More! 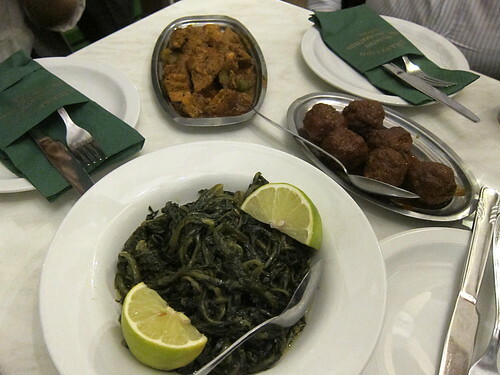 Clockwise from the bottom: a new favourite – horta (boiled wild greens), another meat dish (beef? ), meatballs in tomato sauce. It didn’t end there! The freshly fried stuff coming out of their kitchen was all excellent. Fried whitebait was crisp and non-greasy. 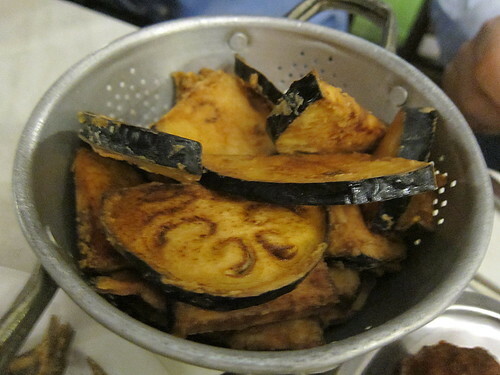 … as were fried aubergines. 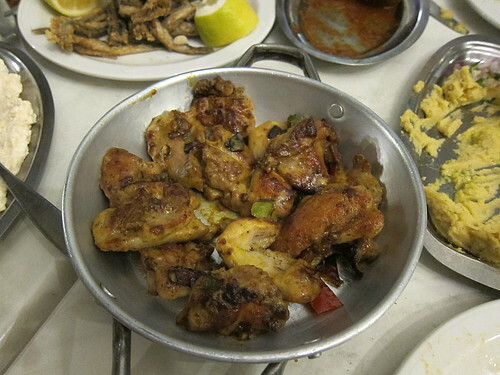 One of our other meat dishes was a tigania chicken, a sauteed chicken dish made with lemon and mustard. There was also a tigania pork with balsamic vinegar and honey. 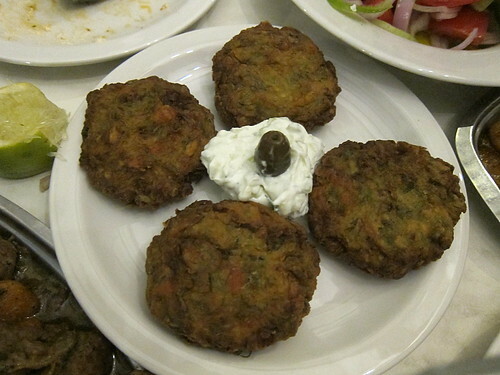 Courgette and feta fritters were also delicious if a bit salty; nothing a lot of tzatziki couldn’t solve though! There were other dishes too – too many to keep track of! 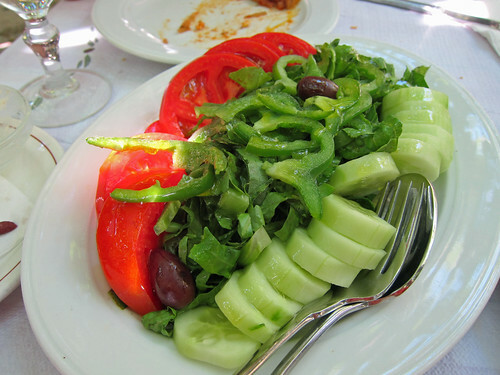 I recall a Greek salad and fried courgettes and fried potatoes. And maybe another meat dish. How many is that already? 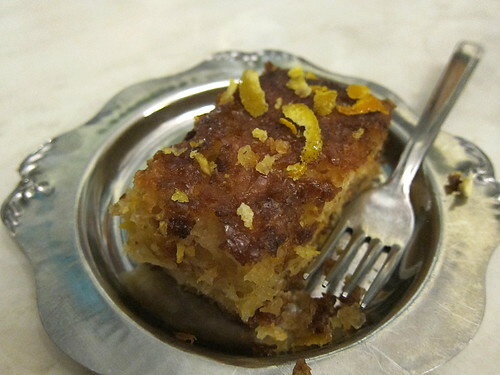 Dessert was another slice of the typical syrup-soaked cakes I’d been seeing – this time orange. It’s a fun place to eat and to eat well too. I enjoyed working my way through an excellent spread! On my last day, a quick trip to the supermarket about a 2 minute walk from my hotel ensured that my dried oregano supplies are now at their freshest. 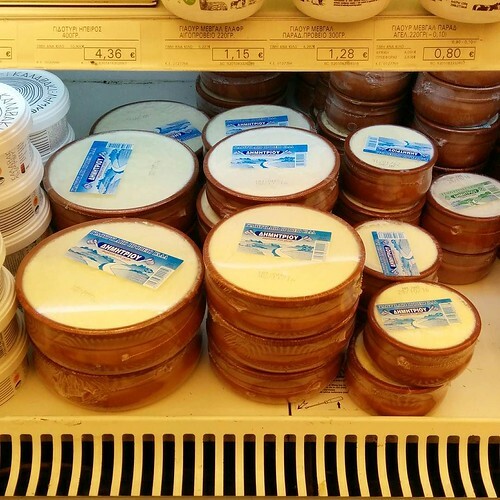 I also loved seeing the impressive range of feta and Greek yoghurt available! 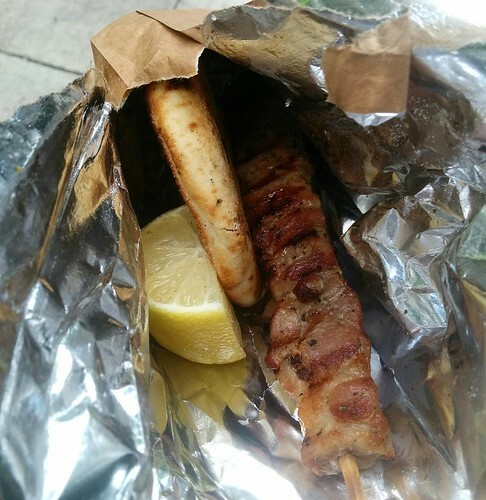 Before heading to the airport to catch my flight home, I also couldn’t help popping back into Ravaisi to get one last stick of pork souvlaki (they call each souvlaki stick kalamaki) – this was a perfect snack! 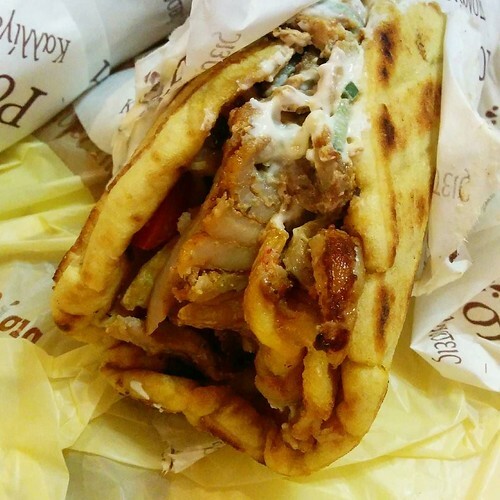 Ah, I really do miss Athens and all the amazing food I had there! One thing I did notice was how fabulous all the tomatoes were at all restaurants, even at the cheapest places. 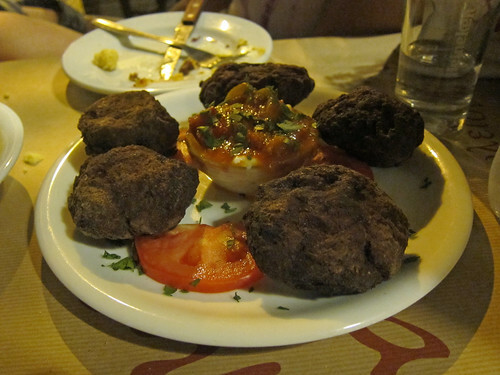 Actually, all the ingredients were top notch everywhere…this is some excellent Mediterranean cuisine! As usual, all my photos can be found in this Flickr album. 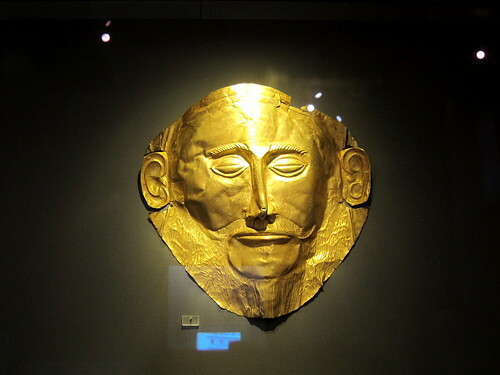 It was certainly a whistlestop visit to Athens. We’d be there for 36 hours and hoped to see everything; unfortunately, the heat and Greek opening hours forced us to hit the high spots. 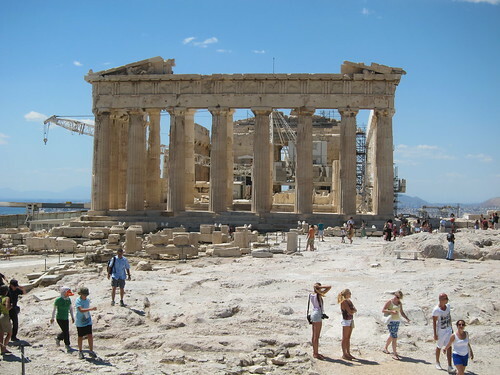 After a late start (the breakfast at our hotel was just too incredible to rush), we visited the Acropolis where we marvelled at all that white marble and acquired serious tans. When we crawled back down off the rock, it was off to search for some lunch and we picked Diogenes out of one of our guidebooks. 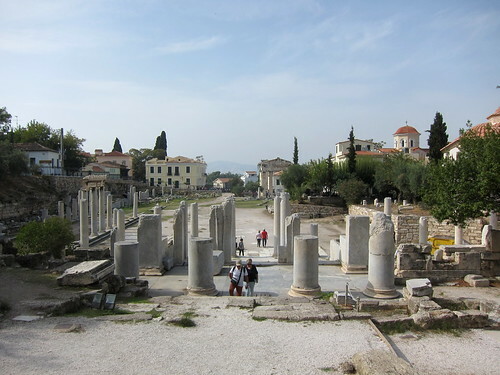 We dined in gorgeous settings, sitting on their shaded terrace overlooking the Lantern of Diogenes. 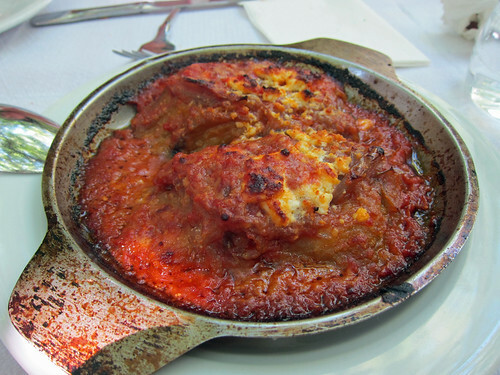 Aubergines Diogenes were baked aubergine halves bathed in tomato sauce and topped with feta. 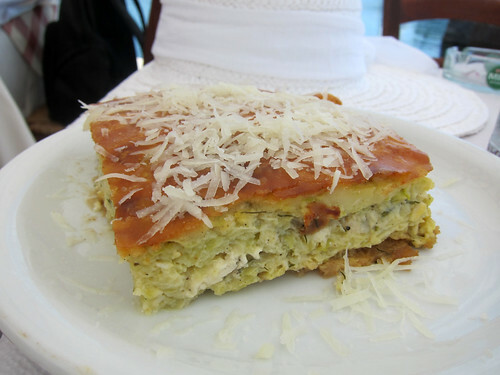 I’d never thought of baking feta before and I loved its salty tang on top of the rich mixture. We couldn’t handle another big chunk of feta by this point in the trip and so settled for a much simpler, but no less generous in size, salad. Looking for something relatively light as a main, I turned to one of the day’s specials of stuffed courgettes with a lemon sauce, the lemon sauce being avgolemono. The hollowed squashes were stuffed with herbed rice and meat and the gentle lemon sauce was delicious on top. 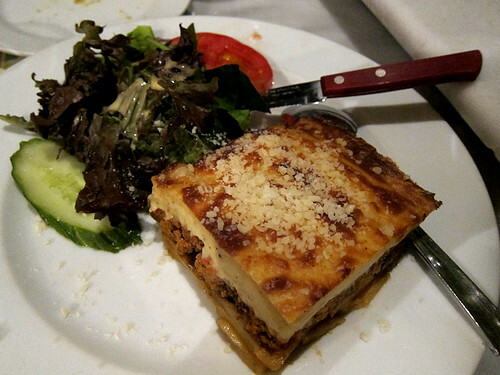 My friend had been dying to try moussaka in Greece and the version at Diogenes did not disappoint. I’ll admit that it didn’t look like much but it was delicious. Sure, it was a bit touristy but the food was very good. I think lunch ended up costing about €20 a head. As I mentioned previously, suddenly we realised that all the other archaeological sites we’d hoped to visit were closed, having shut their gates at about 2pm. That afternoon passed in a bit of a blur and I vaguely recall visiting a cafe for coffee and then falling asleep on their roof terrace. Oops. We did manage to wake up and walk over to Syntagma Square and then across to the Greek Parliament where we watched the guards. Further on, we also came across an adorable deli in Kolonaki – Degustation – run by a very kind Greek-Australian who told us not to worry about the groups of waiting riot police in the area. 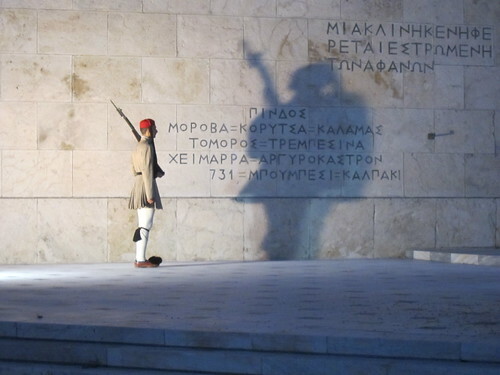 That’s what happens when you’re hanging around the Greek Parliament at night. It was pretty late in the evening when we finally sat down outside the Mezedopoleio Filema for dinner. 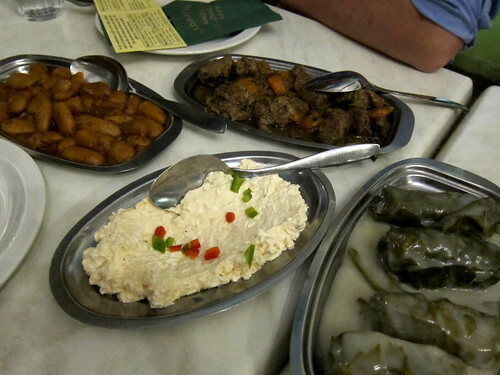 As you can probably guess from its name, it serves meze and only meze and that was just what we needed. I didn’t expect the meze portions to be so huge though! 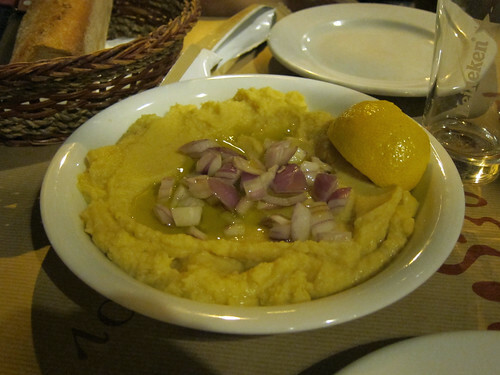 Fava was a dip of mashed yellow split peas scattered with chopped onions and drizzled with olive oil. I adore lentils so this simple dip was right up my alley. 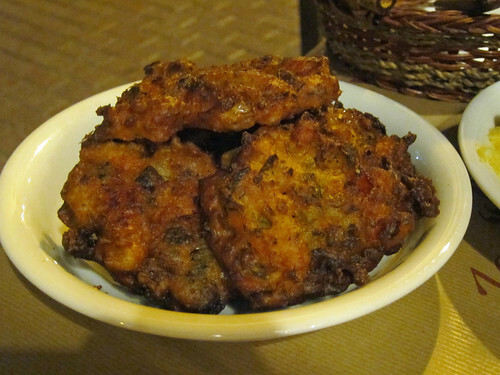 Tomato balls were humongous fried tomato fritters, all crisp yet juicy – I never would have thought to make tomato fritters. Filema Meatballs were huge fried juicy meatballs served with yoghurt and a tomato salsa. Each meatball was almost as big as my fist. 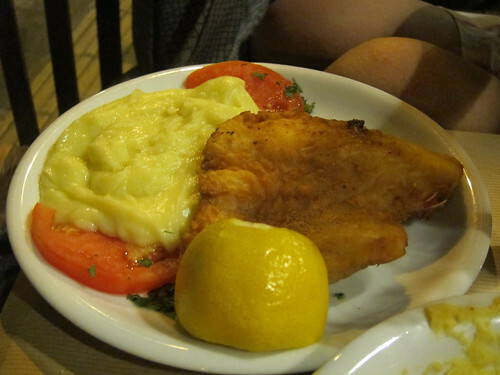 The fried cod was the only semi-dud – I think we had been expecting fresh cod but I think we ended up with what was originally salted. The skordalia, a garlicky potato mash, was utterly scrumptious but do make sure everyone eats some before you end up the only stinker. The place is a total bargain – the bill was under €30 for all this food and a large bottle of water and it could easily have fed 4 people. 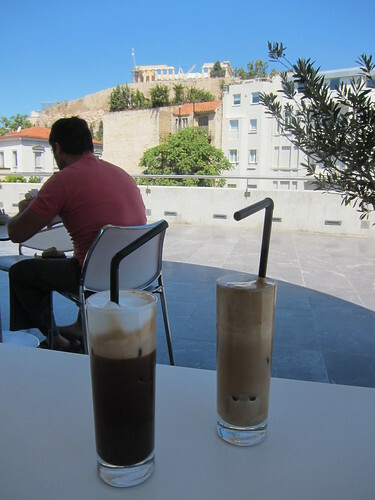 Try to leave some time to have a coffee at their cafe – choose a seat on their terrace and you’ll be rewarded with a splendid view of the Acropolis. We just had enough time to squeeze in a quick lunch before heading to the airport for our flight home. We met up with colleagues at Monastiraki Square where all the famous souvlaki restaurants are and the one our Athenian colleague brought us to was Savvas. Beef souvlaki sandwiches all around (under €3 each) and plenty of tzatziki on the side to dollop over it. Greedy me couldn’t resist ordering a side of fried aubergine as well. 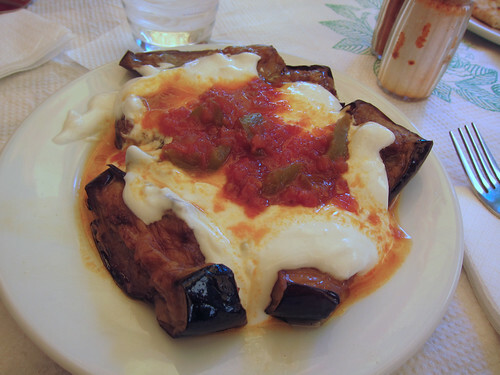 Big chunks of soft fried aubergine were covered in yoghurt and tomato sauce and were incredibly delicious. 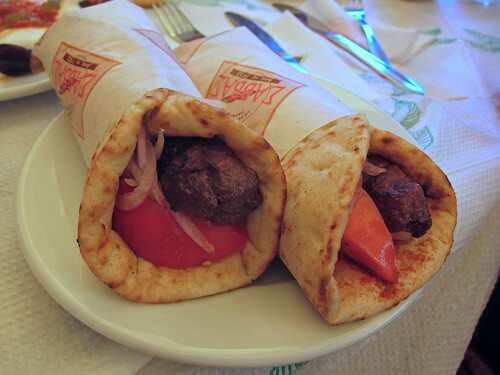 Shame we didn’t have the stomach space to try all the other souvlaki places along the street! 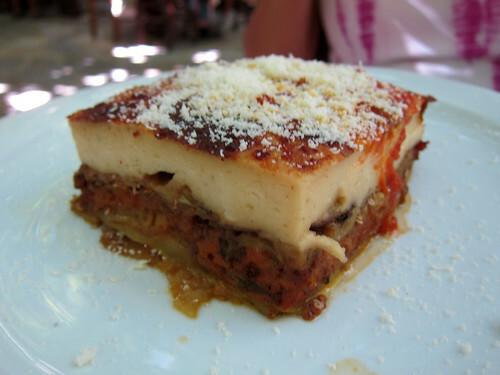 There’s lots of good eating to be had in Greece, even in Athens. I do hope to return to see the rest of the temples, hills and markets I missed. A warning though – you might end up being dinner yourself. I was eaten alive by mosquitoes – use lots of insect repellent! 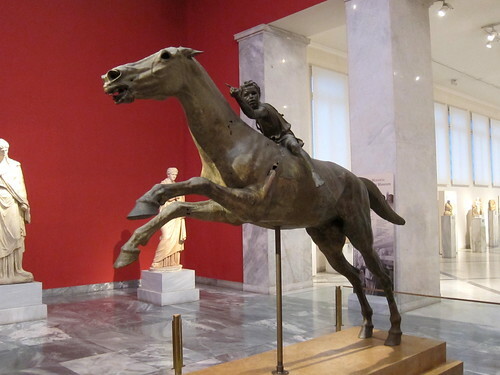 All my photos from Greece can be found in this Flickr photoset. I never considered myself as a beach holiday person but after a recent trip to Molyvos (also known as Mithymna) on the island of Lesvos in Greece, well, I’ve learned that I definitely can be. 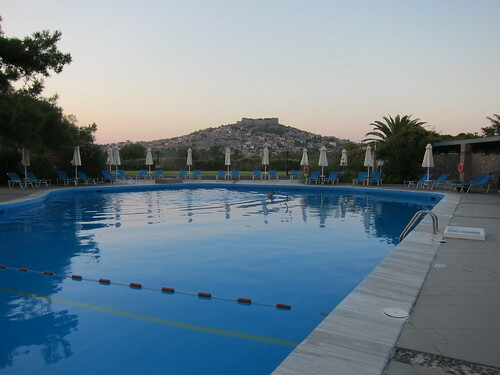 I stayed four days at the Delfinia Hotel for a friend’s wedding and apart from the wedding there was plenty of time to explore the village and laze by the pool. Greek time is fantastic…everything seems to go in slow motion…or maybe it was all that napping by the beach and hotel pool that made it feel like weeks rather than days! And the food! 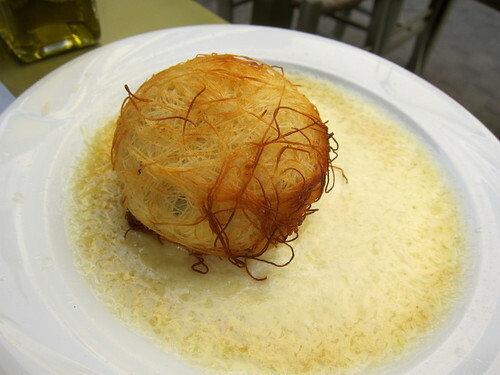 The food was generally utterly fantastic and always fresh – these were my favourite bites during my time there. On the day we arrived, we were all pretty shattered after an overnight flight and connection at Athens and after long naps, we rose at about 4pm to have lunch and were driven by the bride-to-be to Taverna Vafios just outside Molyvos (their website has a good map). Oh, how we feasted as if we hadn’t eaten for years. 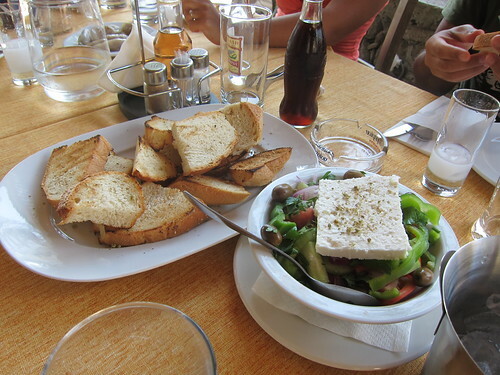 Toasts grilled with olive oil and oregano arrived first with a Greek salad that started my love for feta cheese. That toast sure came in handy for sopping up all the delicious sauces from our main courses. The meze were all fantastic. 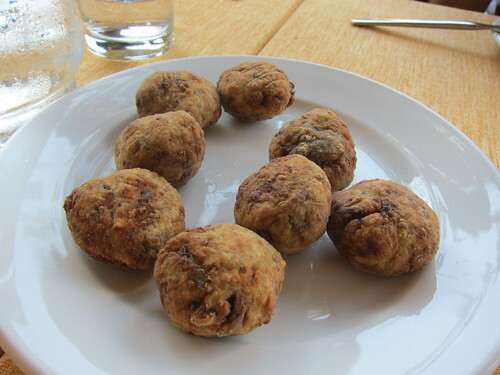 Onions were stuffed with rice and meat and aubergine balls were little fried fritters of the mashed vegetable. 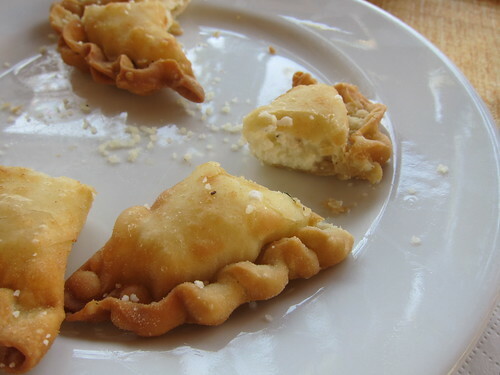 Cheese pies were fried and well…there was cheese in lots of things – stuffed into courgette flowers, put into tomato fritters, and one of my favourites, fried! Main courses were generally good but these two were excellent. 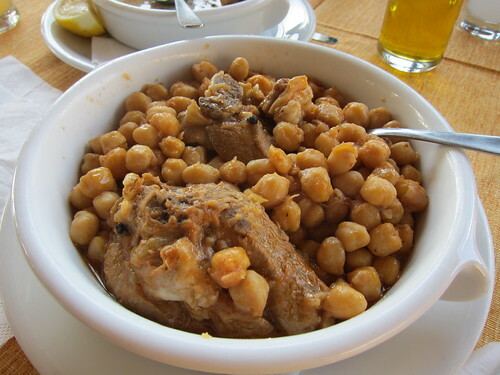 Chunks of tender pork had been cooked in wine and oregano and was my favourite dish but lamb with chickpeas was also fantastic, having been cooked with just a hint of cumin. This wasn’t even half the food for all of us (I think about 10 in total) and along with a few beers and ouzos, the meal came to only €15 for each of us. After even more lazing about by the pool, we met up later that night to eat again. 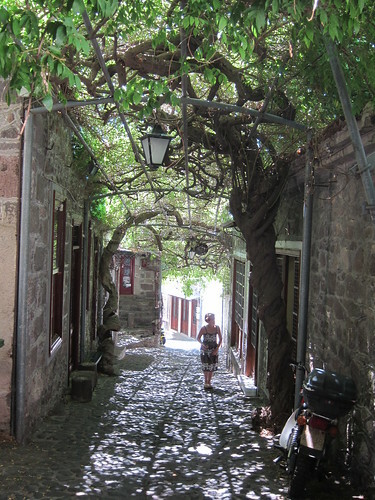 This time, our destination was in Molyvos, in its harbour. Their working harbour is lined with fishing boats bringing in fresh catches at all times of the day; needless to say, there are plenty of cats waiting for a treat. Facing the boats are lots of restaurants and ours was near the end – The Captain’s Table. 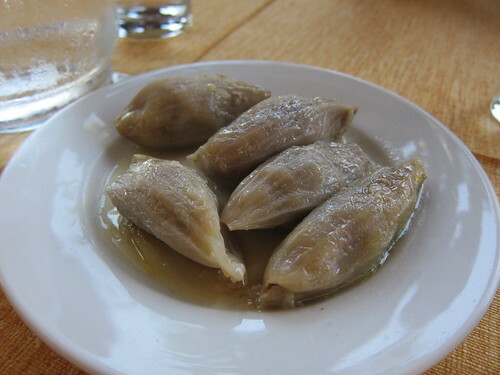 Among the meze shared on the table, of particular interest were the salted sardines (sardeles pastes). 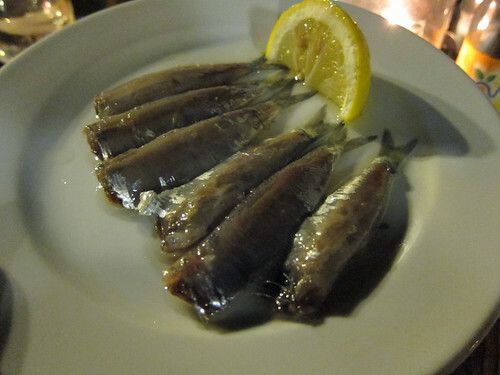 The sardines served on Lesvos are quite well known and this is one particular method that is popular to eat with ouzo. They are fresh salted sardines and their flesh has been cured by the salt. They’re, you know, salty but very tasty if a little spiny. 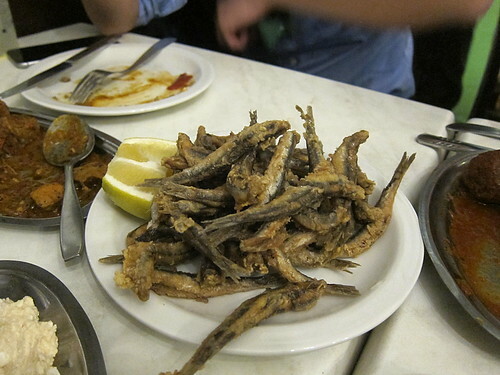 We also had some amazing anchovies served with lots of olive oil but I didn’t get a good photo of them. Individual main courses were ordered and many of us went with The Captain’s Platter which was just as humongous as it sounds. 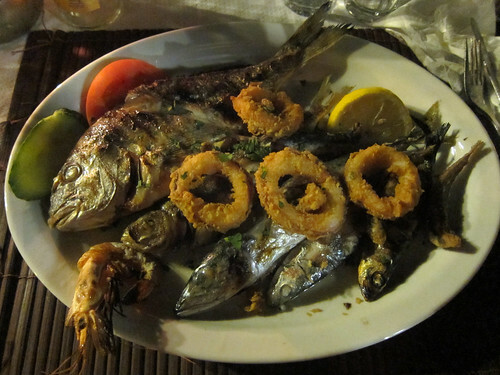 There was a variety of grilled fishes, from sardines to a whole sea bream, as well as a large grilled prawn and some fried calamari. Everything was incredibly fresh and delicious and I struggled to finish even half of this plate. A bite of a friend’s grilled octopus was equally fantastic. Again, with drinks all around, the meal came to €15 each again. It was an absolute bargain for all that seafood. 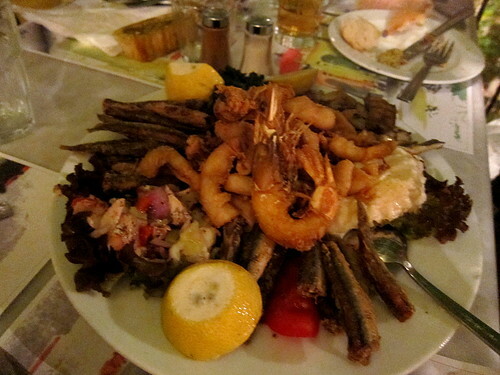 Almost all the seafood served here had been caught locally by the fishermen in the area. 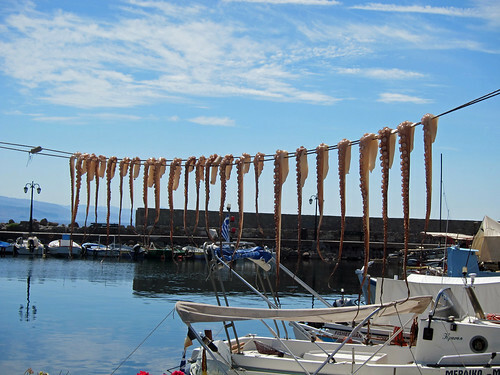 The next day, while wandering around the harbour and village in the morning, we came across lots of octopus tentacles hanging out to dry in the sun – these below were hanging outside of The Captain’s Table. It’s a brilliant sight and one that triggered our visit to the Octapus restaurant in the harbour for lunch. Oddly enough, we didn’t order any octopus! 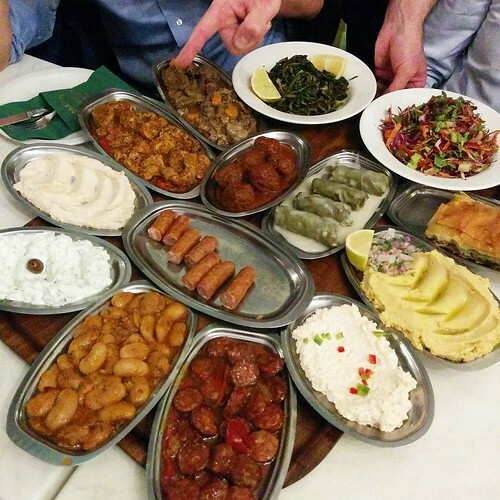 We did have a few meze though. 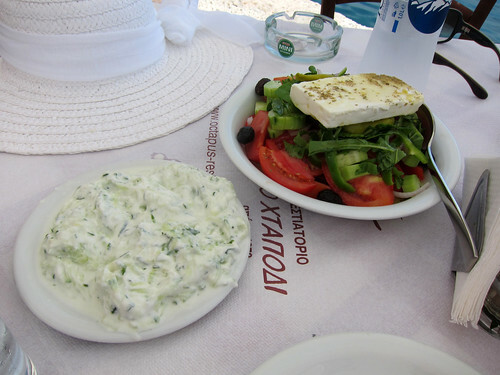 Their tzatziki was very good and very garlicky and, of course, we ordered a Greek salad too. 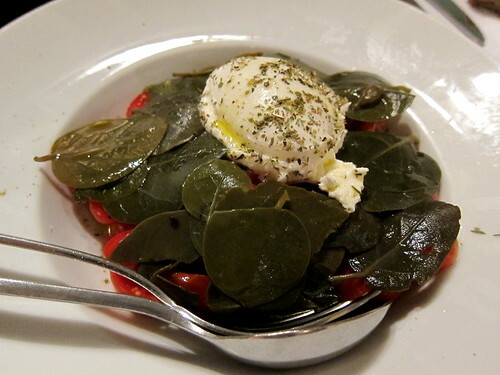 I never encountered a bad Greek salad in Greece. 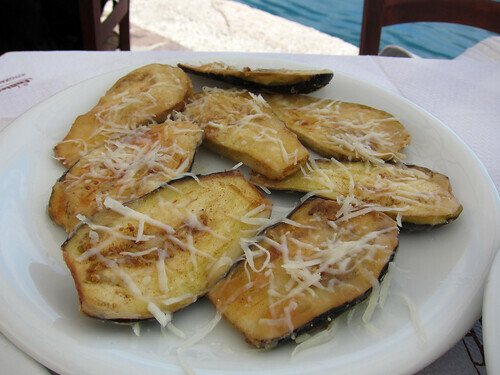 These slices of fried aubergine may look a bit anaemic but they were perfectly cooked and crisp. Fantastic. 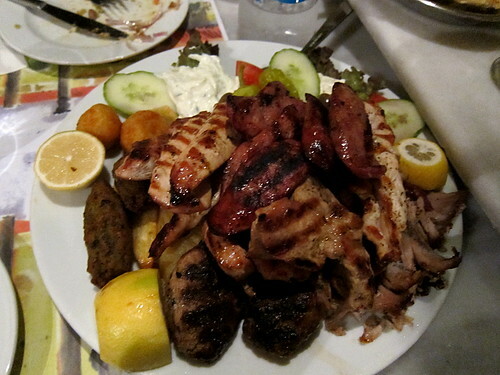 Our main course of pork souvlaki was quite dry though and I’d recommend sticking to the meze and seafood. This time, with only two of us sharing and only a bottle of water between us, the bill came to…€15 each. This must be the magical island of €15! 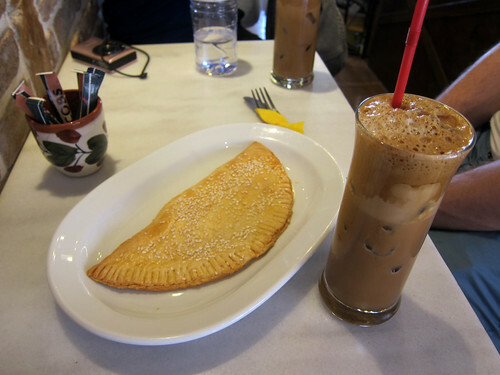 We were utterly smitten with the tiny Cafe Oysia and loved their frappe and cappuccino freddo (we were told there that the young Greek people now preferred the more trendy cappuccino freddo to the traditional frappe). Their cheese pie was also very good. They’ve only got a tiny balcony, with two tiny tables, that overlooks the harbour and beaches. We lazed there for ages with our frappes and wondered if we really needed to return to London. We went back the next day, making us regulars in our eyes. The proprietor even recognised us the second day and saved us a seat on the balcony when others left! I do wish we had had time to try all the sweets in their display. 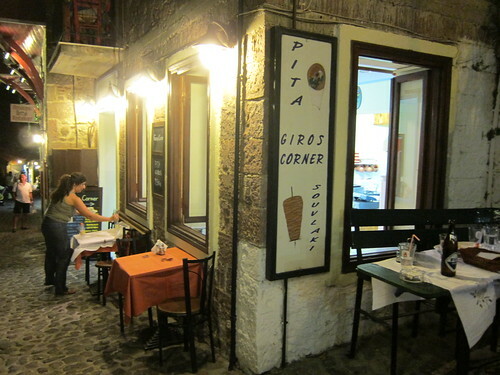 We stumbled upon Giros Corner when looking for a light dinner and it immediately charmed us. To the left of that photo below was a gorgeous view over the sea. I loved eating outside in Molyvos and the beautiful views available everywhere certainly didn’t hurt. 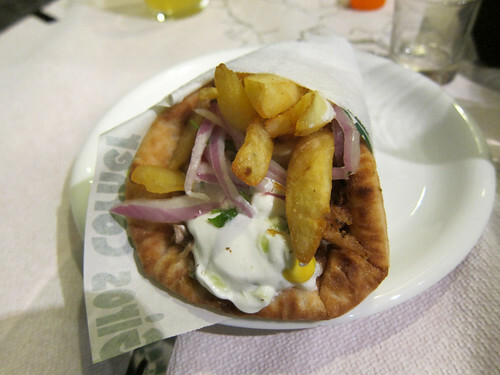 This was pork giros with tomatoes, onions, tzatziki and chips all wrapped in a beautiful pitta. It was just as good as it looked…and the best part? Only €2.50. 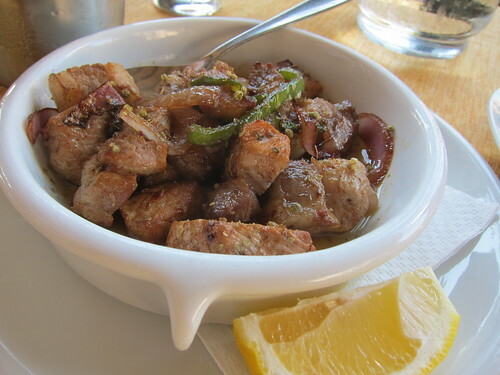 They also serve souvlaki and it was significantly better than that we’d had earlier at Octapus. Still, I think their giros are better. Even the food at our hotel (the Delfinia Hotel) was delicious. 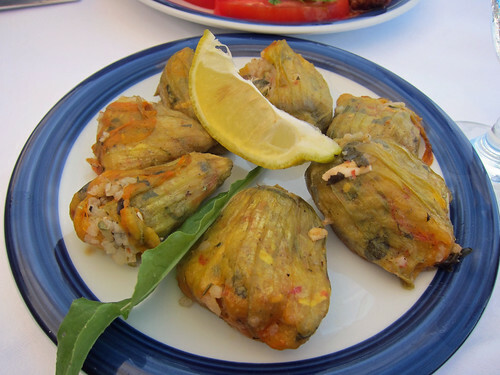 These courgette flowers were stuffed with rice, cheese and dill and were incredibly moreish. For drinks at night, we went up to the castle where there was a cafe/restaurant. It’s a beautiful place at night (and also not bad to visit during the day though it’s a bit hot) and it was clear enough for us to spot the Milky Way up in the sky. There’s also a loud but popular beach bar down by the beach and also a little place that had traditional Greek music on Friday evenings (not sure about other nights) along one of the market streets. And, of course, the wedding was pretty amazing too. The bride arrived by boat! The groom’s niece was incredibly cute! 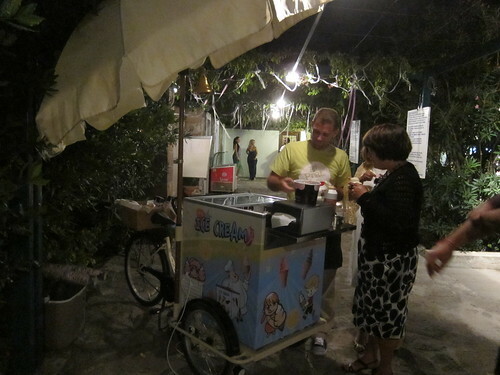 And they had arranged for an old fashioned ice cream vending bicycle to be part of their wedding reception! 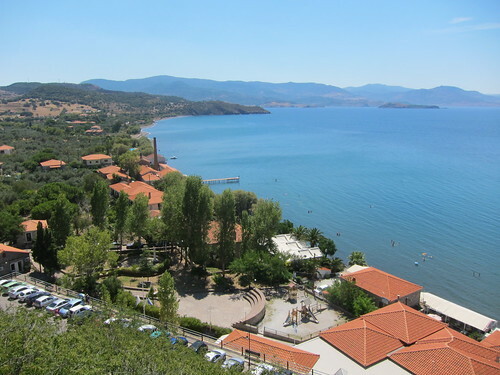 To get to the village of Molyvos, you need to first get to Mytilene, the main city on Lesvos. From there, you’ll need to either book a taxi (they are crazy) or rent a car or wait for the infrequent bus to get to Molyvos. I could have spent a week there easily, exploring every nook and cranny of the village and nearby villages too. 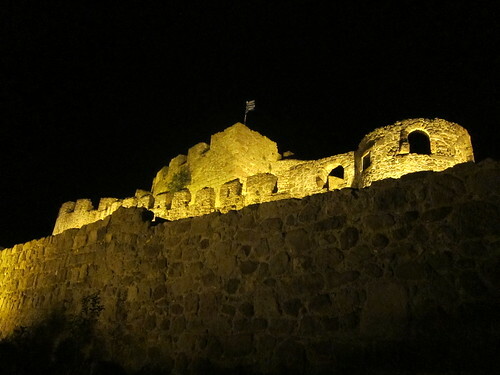 For more information about the island, do take a look at Matt Barrett’s excellent Lesvos Guide.